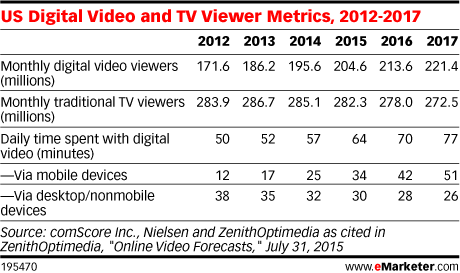 Data is from the July 2015 ZenithOptimedia report titled "Online Video Forecasts: 2015." The data is based on information from ZenithOptimedia forecasts and local/regional sources for 65 countries. Media consumption measures the amount of time spent with each media. The data is for 2010-2014 while figures for 2015-2017 are forecast data.